Best of the best! Snowy Creek is unquestionably the best location in Whistler for the avid ski family and large groups with ski-in access directly from the slopes and within a short 3-5 minutes walking distance to both Whistler & Blackcomb high speed gondolas. Our luxury, 2500 square foot, 5 bedroom unit is located in Whistler's very best slopeside ski-in access. Snowy Creek is an easy 3 minute walk to Whistler village, pubs, shopping, fine restaurants and a thriving night life. Apres ski at the Longhorn, GLC pub, Dubh Linn Gate Irish pub, Buffalo Bill's night club plus others. All within a 3 minute walk from Snowy Creek. 4.5 bathrooms, includes gourmet kitchen, private indoor hot tub, 50' flatscreen television, free high speed wireless internet, on-line movie rentals and all the comforts of home. This private setting offers a quiet mountainside retreat and after an exhilarating day of skiing, soak in our private indoor hot tub, then relax in plush leather furnishings in front of the gas fireplace with a glass of wine. When you book our beautifully renovated accommodation, you certainly won't need your car. Just leave your vehicle parked. Whistler Blackcomb, the destination of amazing mountain activities and the perfect get-away location. Owner Operated!!! Save on taxes!! Only 5% GST taxes on this unit as it is owner direct. Hotels and Property Management Companies charge 15% taxes. 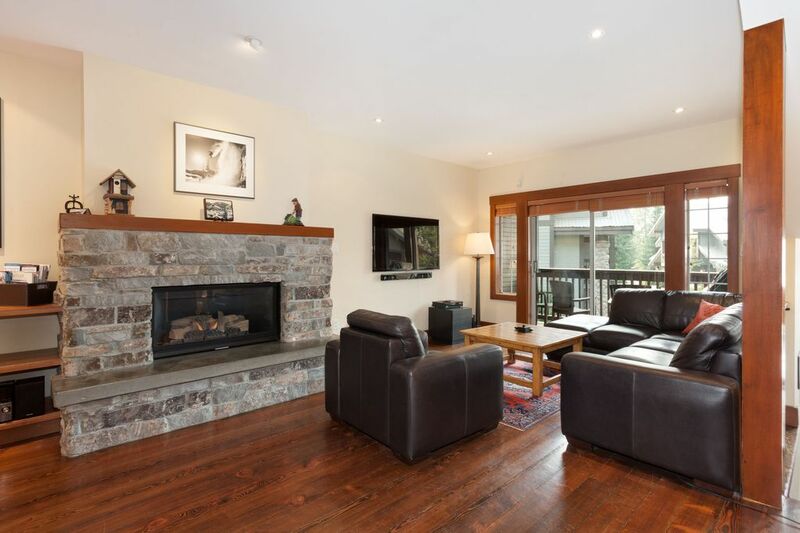 Keywords: Whistler Vacation Rental, Sleeps 12, Ski-In access, Hot Tub, Garage, Close to Village. This property is in the very best location in Whistler for large families & Groups and only a flat easy walk to Whistler Village & the Upper Village. Located at the base of Blackcomb Mountain with ski in access on the Whistler Village Run. Only 3 minutes walk to international shopping, pubs, fine restaurants, apres ski, night clubs and bars. Amazing location. Master - 4 piece with shower & tub Bathroom 2 - 4 piece with shower & tub Bathroom 3 - 3 piece with large shower Bathroom 4 - 3 piece with shower Half Bathroom - 2 piece with toilet & sink. Whistler Mountain Resort has been rated the #1 Ski Resort in North America for several years. Whistler Mountain hosted the 2010 Winter Olympics. Only a 3 minute walk to Whistler Village from Snowy Creek complex. Amazing location situated at the bases of Whistler/Blackcomb Mountains. Ski-in Acess on the Whistler Village Run. Ski-out Acess on the Whistler Village Run. Telephone for local calls only. Single care garage. Also great for storing skis and bikes. Open concept with plush leather couch and armchairs. Dining area overlooks large private deck. 50" Flat screen in Living room. Really enjoyed our time in Whistler and this was made even better by the Accomodation. The Accomodation surpassed expectations. Rooms were large ant airy. Location was great. Instructions were perfect, hot tub great. Just great! Nothing to complain about at all!!! Beverly was very responsive in dealing with a minor issue. Mentioned it in the morning and all resolved when we got off of the slopes. Working with the owner was amazing. Great place to stay and enjoyed all the accommodations of the unit. Amazing property and a great location! We have done multiple ski trips to various locations and this property is by far the best we’ve stayed at. It is walking distance to everything you want to do in whistler. Comfortable for a large group and the owner is on top of everything and easy to communicate with. Will definitely stay here again if I’m ever in Whistler again and highly recommend it. Thank you for this wonderful review Stephan and look forward to having you and your group stay with us again in Whistler. Very spacious well maintained property with amazing access to Whistler Village. Beverly is a gracious, responsive owner. I would love to be back for our future Whistler vacations. Thank you Alan. It was pleasure having you all stay with us in Whistler. We look forward to having you stay with us again and a very Merry Christmas to you all. Thanks for that excellent review, Chris. It was a pleasure having you all stayed with us at our townhome in Whistler and look forward to having you stay with us again in the very near future. Beautiful town home. Close to town but far enough away from the noise. Thank you for that great review. It was a pleasure having you and your friends stay with us for your biking adventure. We would like you to remember us for your next visit as we offer a rate discount to our guests returning. **PLEASE NOTE THAT RATES USUALLY DEFAULT TO US DOLLARS. USE THE CURRENCY DROP DOWN TO SELECT CAD. * RATES ARE SUBJECT TO CHANGE UNTIL RESERVATION IS CONFIRMED. STAYS OF LESS THAN FOUR NIGHTS WILL BE SUBJECT TO ADDITIONAL SHORT STAY FEES. CANCELLATION POLICY Cancelled bookings will not receive a refund.